With the WIA's recruitment of CB operators to ham radio's Foundation Licence, the popularity of using a StationMaster on the lower HF bands has increased markedly. The StationMaster is a end fed vertical half wave for 27MHz, and includes a large tapped base inductor for impedance transformation to suit 50 ohm feedline. Some users modify the base coil in some manner to improve or adapt impedance transformation to better suit application on 80m and 40m for example. The radiator elements includes all conductors that carry current that contributes significantly to the far field radiation of energy. Let us consider a typical installation to be the 5.6m long StationMaster mounted on a free standing 6.5m length of galvanised water pipe buried 900mm in average ground. 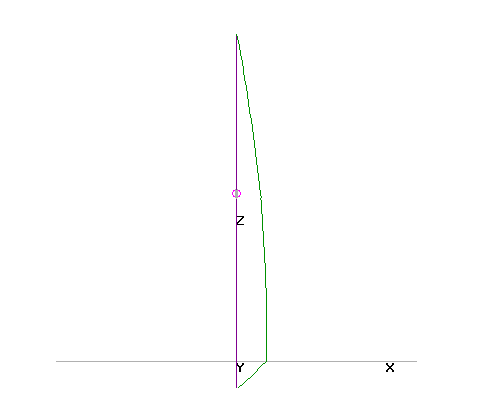 Fig 1 shows the current distribution (green) on the StationMaster and its partly buried supporting mast from a NEC4 model at 7MHz. The feedpoint (the base of the StationMaster) is the small red circle (about half way up). 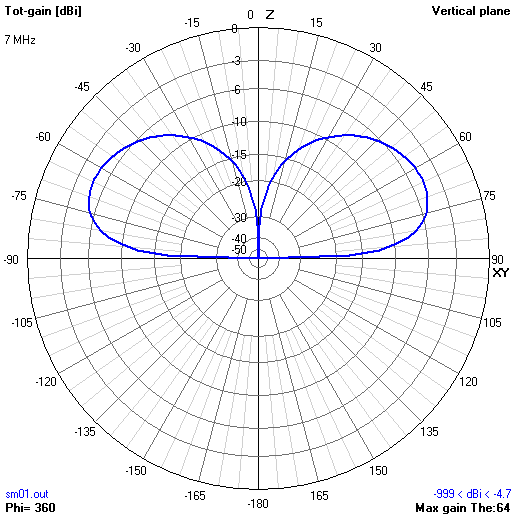 Fig 1 reveals the true nature of the antenna, it is a 11m high grounded monopole with an elevated feed point. Far field strength is due to current times the length of the conductor in which that current flows, Ampere metres (Am) if you like. Note that in Fig 1, there are more Ampere metres due to the support mast than the StationMaster itself. Fig 2 shows the elevation gain pattern of the radiating system. Note that it does not take account of losses in matching networks or feedline. The maximum gain is -4.7dBi, and about 10% of the power input is radiated. 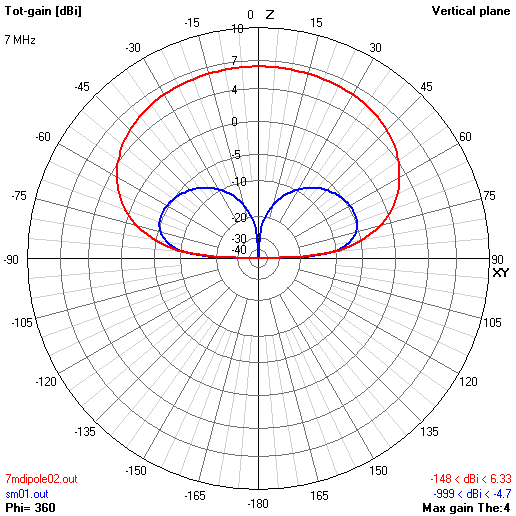 Fig 3 compares the gain characteristic with Bowral 7MHz dipole for local contacts. The gain of the StationMaster is never better than the dipole, and 10dB worse at high radiation angles used for local contacts. By contrast, 84% of the power input to the dipole is radiated, 9dB better than the StationMaster. Transformation of the feedpoint impedance of the StationMaster to 50 ohms can be peformed with a large tapped shunt coil. If this is implemented well, losses in this element can be held to just tenths of a dB. Properly matched, the feedline loss of the StationMaster is very similar to that for a dipole. Note that an off-the-shelf StationMaster used on 40m will have extreme feedpoint impedance, and result in extreme feedline and ATU losses (quite likely 10-25dB of additional loss depending on the configuration). To recommend or use such a thing demonstrates a lack of understanding of antennas. Effective Isotropically Radiated Power is a measure of the equivalent power radiated in all directions that would produce the same field strength. In comparing signal strengths on the band, it is worthwhile comparing the EIRP of a Foundation station running a 10W transmitter and suitably modified StationMaster with an 'average' station running 100W transmitter and dipole. Assuming 1dB of feed system and impedance transformation losses for both systems, EIRP can be calculated for the two scenarios. Table 1 compares the configurations at 45° elevation (path distance ≈500km). The Foundation / StationMaster station is just 0.7% EIRP, or 22dB (≈4 S points) behind the 100W / dipole station. The message to take away is that when you use low power, you cannot afford low efficiency antenna systems.